Tooth sensitivity is an uncomfortable sensation in one or more teeth that is triggered by hot, cold, sweet, or sour foods and drinks. The discomfort can be a sudden, sharp pain and can happen suddenly when triggered. The sensation can shoot deep into the nerve endings of the teeth and can cause people to be hesitant to eat or drink certain foods and beverages. At Gold Hill Dentistry, we know that there are many different factors that can lead to sensitive teeth. Our dental practice is here to help our patients find the cause of their sensitive teeth so that we can treat the teeth and alleviate the discomfort. One of the most common causes of sensitive teeth is from brushing the teeth too hard. Brushing too hard can not only cause the gums to recede, but it can also wear down the enamel and expose the dentin of the tooth. By making sure to use a soft-bristled toothbrush and not applying too much pressure when brushing, many patients are able to reverse their tooth sensitivity. Tooth decay can cause sensitive teeth because the structure of the teeth begins to break down and affect the sensitive roots of the tooth. Gum disease, or gingivitis, from plaque buildup is the inflammation of gum tissue. This can cause the gums to be painful and to bleed while brushing, leading many people to not brush well. Gum disease can cause the loss of the supporting ligaments that hold the teeth in proper position within the gums and expose the root surface that leads directly to the nerve of the tooth. There are many other causes of tooth sensitivity: teeth whitening products, acidic foods, age, overuse of mouthwash, and more. 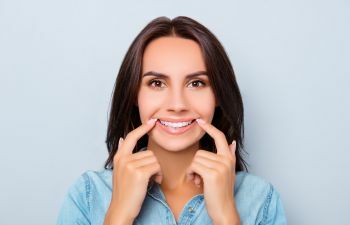 While maintaining good oral hygiene is the best way to prevent sensitive teeth, many times it takes the knowledge of a dentist to get to the root of the problem – pun intended. At Gold Hill Dentistry, we are committed to the health of your teeth. If you have sensitive teeth, do not suffer through the discomfort. There could be a serious oral health issue going on that needs professional care. Call our office today to schedule an appointment.